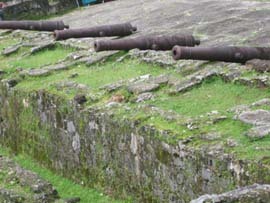 Remains of Portobelo's old Fort San Geronimo, as seen from the customs house. PORTOBELO: The long finger of the Atlantic, dotted with small lush islands, gives this dusty little village an air of tranquility most days of the year. Small concrete-block houses huddle close to the massive church of San Felipe that houses the Black Christ . The church took 10 years to build and was opened in 1814. Stalls selling everything from religious artifacts to lottery tickets crowd the open space around the church. It’s difficult to imagine this tiny, mostly black, community, having much historic significance. Yet it is the site of what was once the third-strongest fortress of Spanish America. It is also a UNESCO World Heritage Site. The massive two-storey customs house with its tall colonnades is now a museum. It was once where all the treasure, the gold and the pearls, from Central and South America was collected before being shipped to Spain. It was destroyed by canon fire in 1744, during the Anglo-Spanish war, and again by earthquake in 1882. It was restored by the Spanish in the mid-1990s who greatly upset environmentalists. The Spaniards used coral from a nearby reef in the restoration, destroying most of the reef. Coral was used to build the forts, too. It is said to be as tough as granite, as light as pumice, and can be cut with a saw. Portobelo and its treasure was a magnet for buccaneers, including the notorious Henry Morgan and British admirals Francis Drake and Edward (Old Grog) Vernon, immortalized in the Royal Navy’s daily rations of rum and water. Vernon’s battle against the Spanish here is also honored in the name of Portobello Road in London, now site of a famous street market. Originally named Puerto Bello (Beautiful Port) by Christopher Columbus when he found it in 1502, by 1586 there were still just 10 houses there. After more than 400 years, Fort Santiago is remarkably well preserved. The original fortress in this part of the world was at Nombre de Dios, 23km to the west, but it was sacked by Drake in 1596. Drake, who had become a bitter enemy of the Spanish when his fleet was attacked and almost destroyed while on a peaceful visit to Mexico, attacked Nombre de Dios with two ships and a few small boats. He captured the community but was wounded in the process and had to pull back. But he knew it was vulnerable, and he recognized the value of the Isthmus to the movement of Spanish treasure. Why attack ships at sea when the riches could be taken on the ground? Indians and escaped slaves flocked to him in the jungle when his hatred for the Spanish became known. Soon, he had an army of guides and spies, and he dominated the trail across the Isthmus. Trains of pack animals laden with treasure were attacked and robbed, camps were fired on at night, and cities were plundered. His vessels laden, he headed back to England. 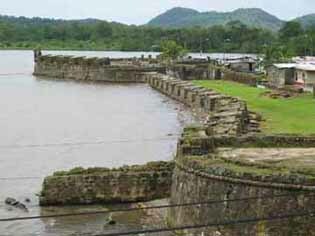 A year later, Spanish defenders began moving to the first of four forts to protect the harbor at Portobelo, one either side at the entrance and two further upstream. The moss-covered remnants can be seen today, their cannon lying in neat rows where they fell when the wooden carriages rotted. Drake, meanwhile, circumnavigated the world and defeated the Spanish Armada off the coast of England. But memories of Spanish riches at Nombre de Dios lured him back to Panama. The community fell quickly and he burned it to the ground. He next set off across the Isthmus to attack Panama City, but the Spanish knew he was coming and blocked the way. Drake simply turned around and headed for Portobelo and its treasures. However, before he reached there, he became ill and died. Six years later, William Parker completed the job Drake had set out to do, and Portobelo was left in ruins. Their wooden carriages long since rotted away, these canon lie in peace after many unsuccessful attempts to ward off marauding pirates. Courage and a little money were all a young English gentleman needed to seek fortune as a pirate in those days. And none was truly worthy of the title unless he sacked Portobelo. The residents must have wondered at times whether it was worth rebuilding just so that the next attackers would have something to destroy. The last of the pirates to whom the British throne turned a blind eye was Henry Morgan. He came 100 years after Drake. He cleaned the community of everything of any value, and then sent a message to the governor of Panama that his next target was Panama City. Two years later, after recruiting a considerable army, he kept his word. He first captured Fort Lorenzo at the mouth of the Chagres River, placed a garrison there, recaptured Portobelo and started up the river toward Panama City with 1,200 men. A fire broke out and destroyed most of Panama City before his victory over it was complete, but that did not stop him from spending a month there ransacking it for valuables. In fact, he did not confine himself just to the city but preyed on the entire area for 50 miles around. He left most of his men behind to extract their pay from anything he might have overlooked. He was not a caring employer, obviously. In fact, his antics in Panama were so outrageous that the British government soon outlawed piracy, not that pirates took much notice. Portobelo may have the distinction of being sacked more times than any other place in the world. It was seen as easy pickings by pirates everywhere. The new British law simply had the effect of throwing together British and French pirates, who had previously regarded each other as enemies. Now, however, both were outlaws and that was a unifying force. Between 1680 and 1688, pirates had a field day in Panama. They destroyed every settlement along the Pacific coast, taking everything that was not nailed down. Then came a brief peaceful interlude, while England and Spain were allies. Raids ceased and communities began to rebuild. That changed 50 years later with the war between England and Spain. The British fleet, under Admiral Vernon, immediately set sail for Panama and Portobelo. That community was defeated once more, and then a second time by Vernon two years later. He then tried to follow Henry Morgan's footsteps to attack the rebuilt Panama City, but the jungle defeated him. Fever ravaged most of his men and he was forced to retreat. The last of the treasure galleons from Peru had turned away when it heard of the British attack on Portobelo. Panama's days of prosperity were ended. Spanish wealth no longer poured over the narrow jungle trail and Portobelo finally knew peace. 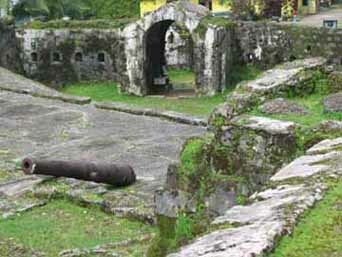 Spanish soldiers remained in Portobelo until 1821, the same year that slavery was abolished. It could have been much more today had it not been for the greed of local landowners. It was proposed as the Atlantic terminus of the Panama Canal, but when the landowners demanded too much money, that distinction went to Colon, now a major town and bustling port. 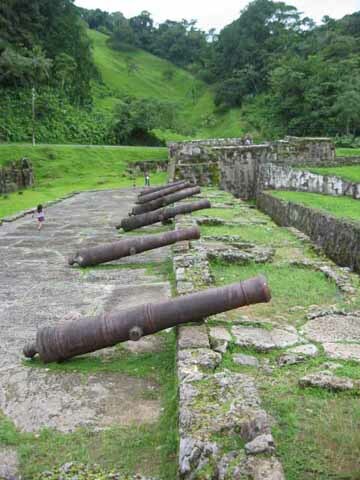 Today, it is hard to imagine the savagery, the shrieks of lust and pain, the roar of canon, the blood, the smell of gunpower and crackle of flames that was so much a part of Portobelo's history. Today it is simply a sleepy little community with a rich past. Just let your imagination run free as you walk through the ruins of the old forts. Their guns really did run hot.